4 years ago I was looking for a different direction to interpret nature that had always been an important part of my life since I was a child, enamored with warty toads, goggle-eyed fish, shiny beetles and velvet robed moths. Concise replical illustration required in the profession of medical illustration was limiting my artistic sensibilities, I wanted to break out of this responsibility and cut loose. Burrowing down in my past with an eye on my ever-present appreciation for graphic representation and ornamental art, the mandala approach was an ah-ha moment. Soon after, I was told by a psychiatrist and friend that discovering and utilizing the mandala approach to creating art was the sign of my acceptance and comfort of “self” and that it was a path to my inner compass. Now I am mining “pearls” and “gems!” What a wonderful treasure hunt it has become! I have borrowed and “made my own” the influences of past teachers and graphic and symbolic approaches I have been taught and seen: The attention to and appreciation for detail from instructors Pauline Ronald, Gerald Hodge, and Craig Gosling, the simplification and elegance of nature forms found in the art of Charley Harper and Alphonse Mucha, and the adoption of the ease and comfort of my own pen and ink style of mark making of lines, squiggles, dots, and dashes turned into a graphic painting style currently found in my nature mandalas. What’s your inspiration? How do you keep motivated? How would you say your surroundings have influenced your work? The astounding talent in the students I have been fortunate to teach in the past 31 years. Their innate ability to problem-solve and communicate science and medicine while bringing their own signature styles to storytelling and their art. And by their enthusiasm and successes! Secondly, every step I take into nature with momentary pauses appreciating every minute detail to the many feathered, scaled, and marvelously colored coats that flora and fauna wear to attract mates and pollinators, for camouflage, protection and predation, and to aid in their locomotion by flight, fin, foot, and seed. Art is: a privilege to pursue, a calm in the storm, a look into one’s soul, a path to peace, a selfish pleasure, a joyful pursuit, a struggle to keep up, a shirt sleeve to roll up, an inner critic to keep at bay, an authenticity to maintain, a canyon, crevasse, and mountain range to cross, a beautiful vista, a solitary individual, a collective community, a style to admire, confidence to acquire, decorative desire, a splash of cold water, a smack in the face, a pat on the back, a stubbed toe, a bruised ego, a renewal and rejuvenation, the warmth of the sun. As a full time medical illustrator and educator for 36 years I am working with surgeons, scientists, and researchers to visualize and communicate their discoveries and techniques to varied audiences. I create art in both traditional and digital media primarily in pen and ink and Photoshop. 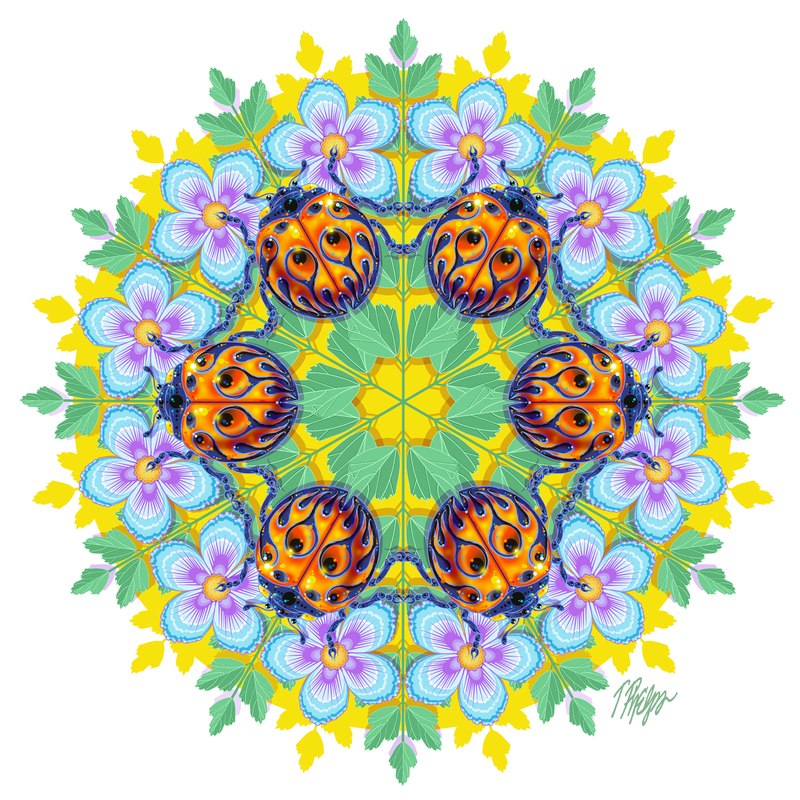 These same skills are utilized in my digitally painted nature mandalas in “my time” hours. From “scribble to sketch to ink” of my organic art assets to digitally paint and decorative detail to final trial and error geometric arrangement, each nature mandala can take from 20 to 30 hours to produce. An appreciation for the natural world found in my art and words— that humans cannot take for granted the interconnectivity of every living organism in our world, that every action has a profound and rebounding reaction, that unless dispense with our myopic view and embrace conservancy the beauty of biodiversity will perish. Very favorably. I hope I have inspired and enlightened others with my art while encouraging an appreciation for the beauty of our earth’s biodiversity with a call to adopting nature conservancy. The success of my story telling and an appreciation of the craft, detail and fun in my works. If not judged as FINE art perhaps it can be appreciated as FUN art. Hey Self, your hope for a pursuit of nature art will not be in vain. What always astounded you in the natural world will be realized in sticking with the truth and honesty of your clever art approach and joyful vision instilled by your father who drew and painted funny little animals for your enjoyment when you were a small child. I would like to have access to a broader audience, be publically displayed, and to see my works in the hands of children. Artist’s bio: “Tim Phelps, with a BFA from Wittenberg University and MS from the University of Michigan, is currently Professor and Medical Illustrator teaching and illustrating for 31 years in the graduate program in the Department of Art as Applied to Medicine at Johns Hopkins in Baltimore, Maryland. He has received over 40 regional and national awards for his artwork published in textbooks, magazines, and professional journals. Projects have included multiple surgical texts and atlases on Otolaryngology, Orthopedics, Surgical Pathology, and Cardiac Surgery. Tim is a Past President and Past Chair of the Board of the Association of Medical Illustrators. He received the Max Broedel Award for Excellence in Education from Association of Medical Illustrators in 2015. Since 1995, Tim has been flame painting miniature diecast hot rods and trucks. He immersed himself in the history of the artform and in doing so has painted over 600 diecast cars in sizes from 3 to 7 inches long. He is the author of Up in Flames: The Art of Flame Painting (MBI 2006). Tim was the artist and designer for Greenlight Toys “Up in Flames” 16 car diecast series in 2008 and 2009 found in K-Mart, Toys R Us, and Meyer stores nationwide and currently online. For the past 4 years, Tim has been exploring the significance of mandalas and mindfulness culminating in his current two-volume “Wonders” series of 11 x 11 inch full color books of nature mandalas published by Schiffer Publishing (2016) that celebrates the earth’s biodiversity and conservancy efforts to save it. A set of nature mandala coloring books (April 2017) followed. Since 2013, Tim has created over 400 nature mandalas, a number can be found on Facebook: PhelpsNatureMandalas and Instagram @phelpsmandala. My nature mandalas cast an artistic eye on the real and imagined architecture of plants and animals. Vibrant illustrations and engaging narrative invite my viewers to wander in and wonder at nature’s seemingly endless variety of beautiful forms, from the simple to the complex, using the graphic and symbolic patterns of mandalas. I combine color, texture, and symmetry to tell the story of organisms and their roles in healthy ecosystems. My plants and animals are presented in visual form outlining morphology and habitat with text descriptions of their importance to medicine and science and conservation issues. Many of the outlines of members of my menagerie are created in pen and ink and scanned, while other images of my animals and plants are created digitally by juxtaposing outlined ovals and cutting them up and repeating and realigning them along with solid shapes and colors layered in Photoshop. For more on Tim Phelp’s Medical Illustration, check it out here at Johns Hopkins.